Mesa Verde National Park is a diamond in the crown of our area and a significant economic driver. Yet, as a community, we have not taken responsibility for our share of preserving the cliff dwellings and other infrastructure. That’s particularly true as federal funding has decreased in recent years even as attendance skyrocketed. Mesa Verde averages more than 500,000 visitors annually. A recent evaluation of the national parks in Colorado showed the park has nearly $64 million in deferred maintenance. Cliff Palace, the largest of the cliff dwellings, requires stabilization, which is underway. Spruce Tree House, another popular ruin, has been closed for a year because of rock falls. Water and sewer, roads and amenities such as the Morefield Campground all need significant work. Enter the Mesa Verde Foundation, whose motto is “Stewards of an Ancient Treasure,” which raises money to support the park and its endeavors. Members aren’t going to raise $64 million, of course, but the foundation’s fundraisers do provide critical supportive funding. One of the foundation’s most visible gifts is right at the entrance. The new Visitor and Research Center was built on land donated to the park by the foundation. And one of its most significant fundraisers begins this week. Rims to Ruins, in its fourth year, is a perfect combination of combining art with the foundation’s mission of preserving and educating people about Mesa Verde and its role on the Colorado Plateau. In June, 31 painters and 6 sculptors (Barry Eisenach and Veryl Goodnight worked in both media) scattered around the San Juan Skyway to be inspired and create works of art to be sold to benefit the foundation. In previous years, the artists were all at Mesa Verde, but the expanded geography for the plein air artwork enticed 18 new painters and sculptors. Because the goal is to raise funds and educate people about Mesa Verde National Park, the art will be sold at the Saks Gallery, 3019 E. 2nd Ave., Denver, on display Tuesday through Nov. 19. At 6 p.m. Friday, ticketed guests ($100 per person) will have a chance to mingle with the artists and enjoy a panel discussion on “Everything You Wanted to Know About Collecting Western Art but Were Afraid to Ask.” The moderator, Ann Daley, and panelists have promised they plan to have fun with it. Daley has had several positions with the Denver Art Museum, including Western art curator. Her panelists will be nationally recognized Western artist Jill Soukup (one of the participating artists), collector Bill Winn and gallery owner Mikkel Saks. At 6 p.m. Saturday, the kickoff Rims to Ruins Art Exhibition and Sale takes place. Tickets are $75, but go to both events, and tickets will be $150 per person. Tickets are available at www.mesaverdefoundation.org/News-Events/2016-Rims-to-Ruins.aspx or by calling (303) 321-3120. There’s a photo gallery with photos of a couple of artists and several pieces in the sale with this story online, and more images are available on the Mesa Verde Foundation website. This fundraiser has numerous moving parts and required major sponsorships. The event’s Gold Sponsors are the Goodnight Trail Gallery and Greenberg Traurig, and the Silver Sponsors are Mercy Regional Medical Center, Centura Health, Marilyn Alkire and Alan Shaw, and Jim and Janet Dulin. Kudos to local Toh-Atin Gallery for being a Bronze Sponsor even though a gallery 350 miles away is the showcase. I know many locals who are often in Denver, either for business, fun or family commitments. This event is a way to support a local cause when you’re in the Mile High City. And if you can’t get up there, contact the phone number above to make arrangements to buy a coveted piece long distance. HHHCheck back at durangoherald.com for more Neighbors stories and photos. Neighbors runs in the Sunday print edition of The Durango Herald and will return Sunday after being supplanted by so many engaged voters who wrote in about the election.Here’s how to reach me: neighbors@durangoherald.com; phone 375-4584; mail items to the Herald; or drop them off at the front desk. Please include contact names and phone numbers for all items. Follow me on Twitter @Ann_Neighbors.I am happy to consider photos for Neighbors, but they must be high-quality, high-resolution photos (at least 1 MB of memory) and include no more than three to five people. I need to know who’s who, left to right, and who to credit with the photo. Candid photos are better than posed, and photos should be submitted as JPG or TIF attachments. 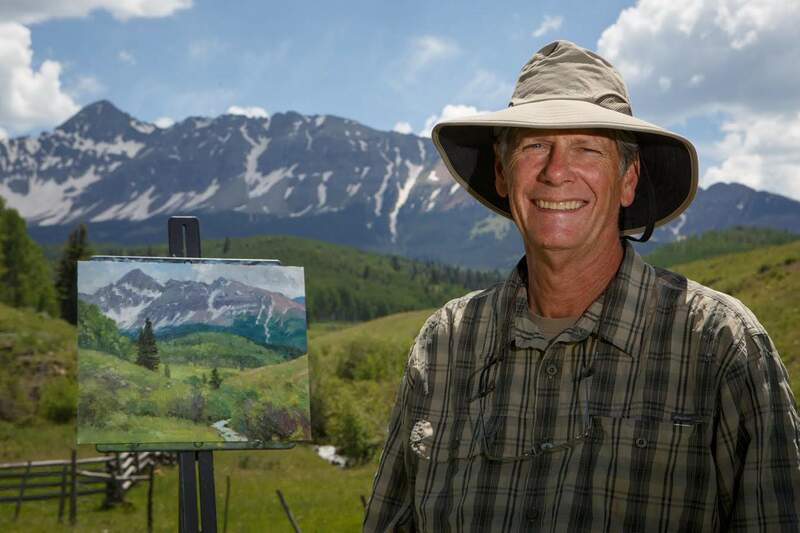 Artist Dan Young, from Silt, participates in a “paint out” tour supporting the Mesa Verde Foundation along the San Juan Scenic Byway near Telluride and Ridgway in June. The art will go on sale at the Saks Galleries in Cherry Creek on Saturday.